BOARDS & BIKES — 24/05/2015 — by Christian H.
Randy Taylor. Randy was a goodhearted, charismatic, creative, incredible person. One of the most fun dudes to be around ever, and one of the most gifted bike riders I’ve ever met. Randy was a natural, there’s no question about it. No one could accuse him of taking anything too seriously, yet he excelled at everything he did – most notably riding bikes, making friends, and entertaining those around him. Everybody loved Randy. Everybody. Between his unstoppable energy, his carefree goofiness, and his unmatched talent for finding trouble, there was truly never a dull moment. Randy always did his own thing, be it in life or on his bike. The phrase “ahead of his time” gets thrown around a lot, but I can’t think of a more shining example than Randy. Now having the benefit of years of perspective on his riding, it’s easy to see how talented and forward-thinking he really was. Even his seven-year-old frame geometry is easlily up to modern standards. Randy may no longer be with us, but we are fortunate enough to have a fantastic video archive of his riding and of his personality. He will forever live on in the collective hearts and minds of his friends, his family, and anyone who enjoys his riding or had the good fortune of interacting with him. The Loosefer Reissue (mutinybikes.com/loosefer) is now available, and we’ll be donating all profits from sales to a suicide awareness charity. Rest in peace Randy. We miss you bud. Some Old School Snowboarding for all you 40+ Shred mice to reminisce about back in the days. 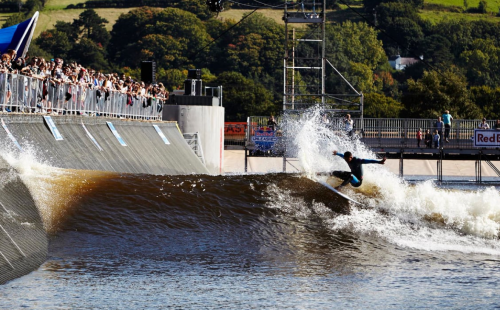 Predictable: The Future of Surfing? Spectators assembling around a pool instead some stinky old beach. Hot dogs served on and off the water. Plastic merchandise grabbed while working your way through an logo-laden entry gate.